Starting the New Year off with marine breeders Striking Gold with Yellow Tangs at Hawaii’s Oceanic Institute. Image: Chatham Callan, PhD. 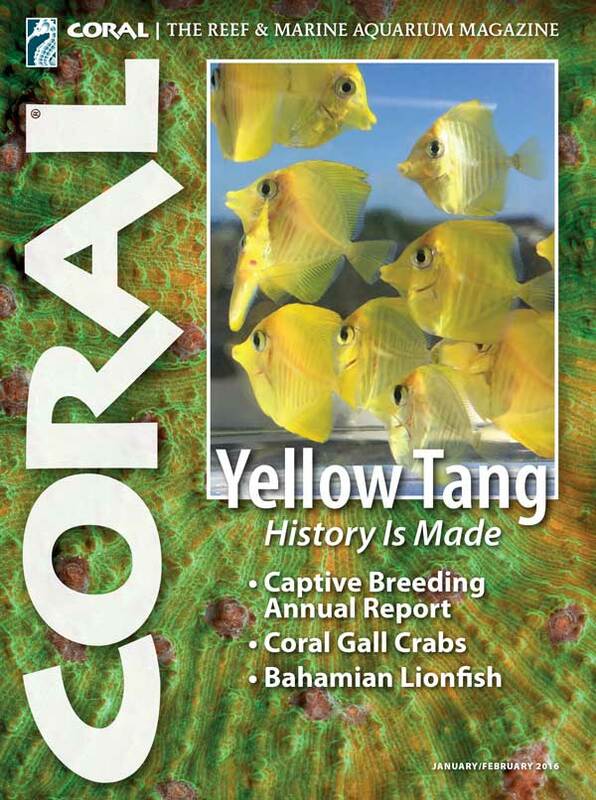 In an exclusive feature article in the coming issue of CORAL, Dr. Chad Callan of the Oceanic Institute in Oahu shares with readers the fascinating success story in breeding Yellow Tang in captivity for the first time—a decades-long tale of trial, error and biological mysteries to be unraveled. With the source of wild Zebrasoma flavescens imperiled by bleaching reefs and calls to ban aquarium livestock collection in Hawaii, having captive-bred Yellow Tang production becoming a reality is truly a Good News event in the history of marine aquaria. A Yellow Tang can live for 40 years, and reef fish expert Scott Michael and underwater photographer Keoki Stender team up to offer lessons in Zebrasoma keeping drawn from observations in the wild and decades of aquarium husbandry. A textbook modest-sized reef in the Swiss Alps from Aquarium Portrait. • Green Anthias: Daniel Knop takes a closer look at a noteworthy reef basslet, Pseudoanthias huchtii, a bold fish of many many colors. • A Textbook Swiss Reef: Gianfranco Pava of Basel, Switzerland documents his success with a very pleasing 110-gallon aquarium that any adventuresome hobbyist can replicate with common sense and off-the-shelf components. 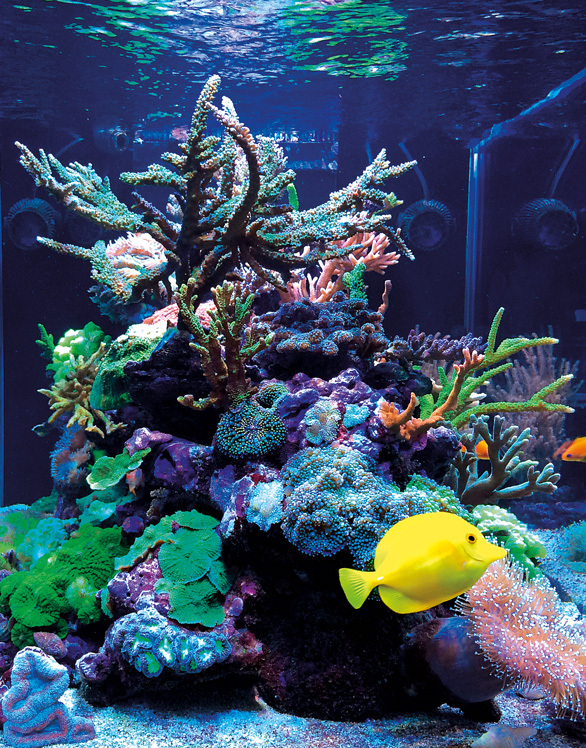 • Marine Breeding Annual: Marine breeders Tal Sweet and Matt Pedersen offer a review of the milestones in saltwater aquarium aquaculture for the year just concluded, easily one for the record books. • Threadfin Cardinalfish, Zoramia leptacantha, is an iridescent beauty that veterinarian Dr. David Watson considers a very special fish and one worthy of his experimental breeding efforts—an inspiration for the aquarist ready to push beyond raising anemonefishes.